There is a fine line between telling my story “sans sugar” and telling too much, or, worse, lacing it with saccharine. The truth is, the narrator is still not exactly sure where she belongs in this world, if she belongs in it at all – but also that this doesn’t matter. It’s all about Jonah. For an only child like me it’s a tough pill to swallow sometimes. It isn’t at all about me. And yet, can I be relieved of my role in all of this? Of course not. Jonah needs his mama. And I can dance around things that were said this weekend, and all the millions of ways, as usual, in which I was spectacularly weak. But I’ll post pictures too, for Jonah was mostly good, albeit scattered and frenetic. It was a sunny day, almost too hot. 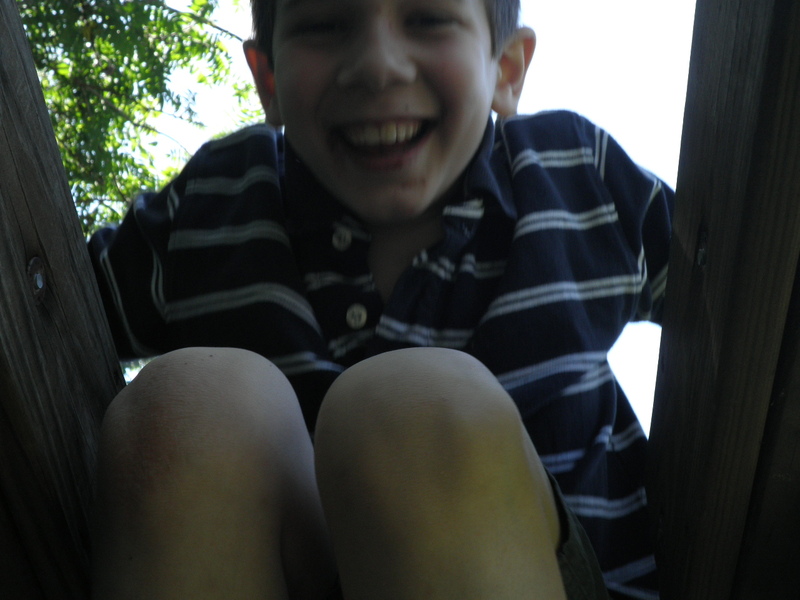 A beautiful Saturday, and a good portion of Jonah’s day and mood mirrored that. Andy was kind enough to drive Jonah up to visit us at my mother’s house. 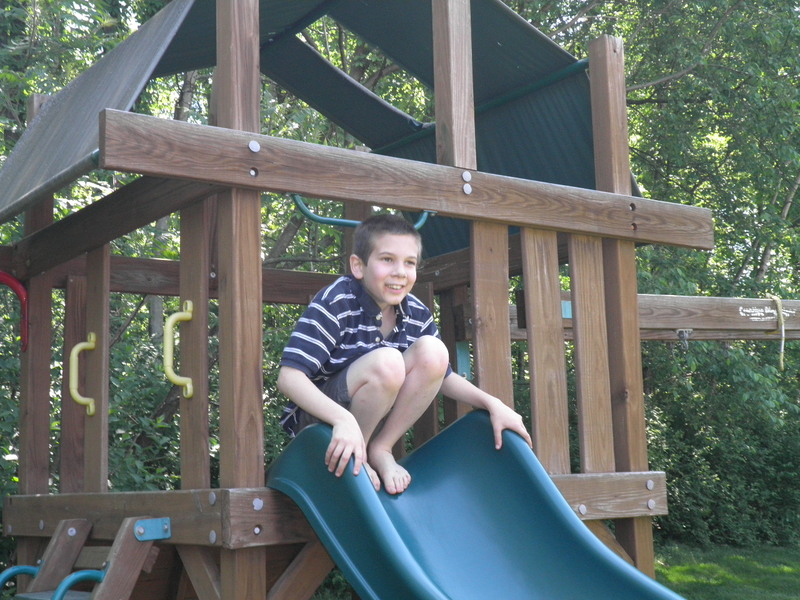 my mom’s next door neighbors kindly let jonah use their play-set and pool, once it’s opened. jonah asked for “Pool?” a dozen or so times. Eventually he wanted to go see train so we piled in the car, Jonah singing along to the Top-40 Andy’s got on the radio. We were relieved to see the green light down the tracks meaning a train is coming, so we pulled into a parking lot to wait and watch for it, like we’ve done hundreds and hundreds of times before. 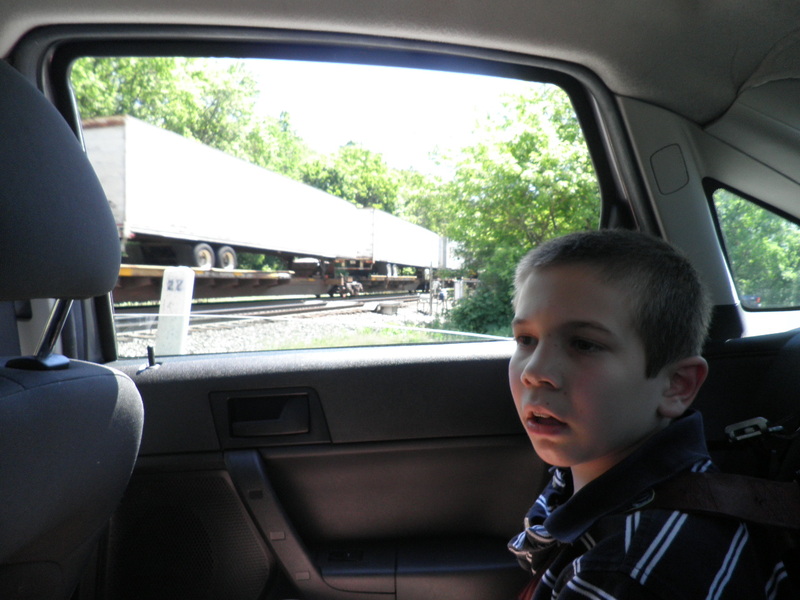 This time, though, he got scared of the train after a few seconds. This was the last of the pictures for the day. Out of nowhere he grabbed for my hair. I know what to do when someone pulls your hair (grab their fist and pull it in toward your head) so it wasn’t a big deal. Andy got out of the car to let me out of the car, and then Jonah burst into tears, sobbing and upset. Within minutes, though, he was okay and we were able to say bye bye to the train (thank God it wasn’t a long one) and go back to Grandma’s for another shower. His beloved train reminded him of how much he misses home? No. Don’t invent things inside Jonah’s head, I tell myself. You’ve got enough troubles inside your own. Today M and I went on a long Sunday ride, just like in the olden days when it was deemed neither wrong nor unusual to do so. When we got home I planted flowers in the God-awful hot for about 13 minutes until I felt I would die. I thought about Andy, and how unless I am mistaken he is working for somebody today doing some mulching under this same heat, and how under that same sun too my boy probably asked for pool ad infinitum. Tomorrow I have to go back to producing numbers; here I can produce words. It’s a fine line, my tightrope. Sundays are difficult. And I only took 3rd place in a “query letter” contest I was hoping to win. And I’m not schooled in query letters. Looks like I have some work to do. First place was the opportunity and $500 to self-publish. I don’t really want to self-publish anyway. Isn’t that, after all, what I’m already doing? Anyway. Jonah has his daddy close-by. Today, after all that hot work in the sun, Andy came and got Jonah and kept him for another part of the day. For me, for now, it is enough. As usual it is still only early evening and I am bone tired. I imagine Jonah settling in to sleep. I miss watching him sleep but imagining it is sweet — I can use memories and visions and dreams. It is good. That fine line. I too have almost crossed it but my BFF stepped in and pulled me back. 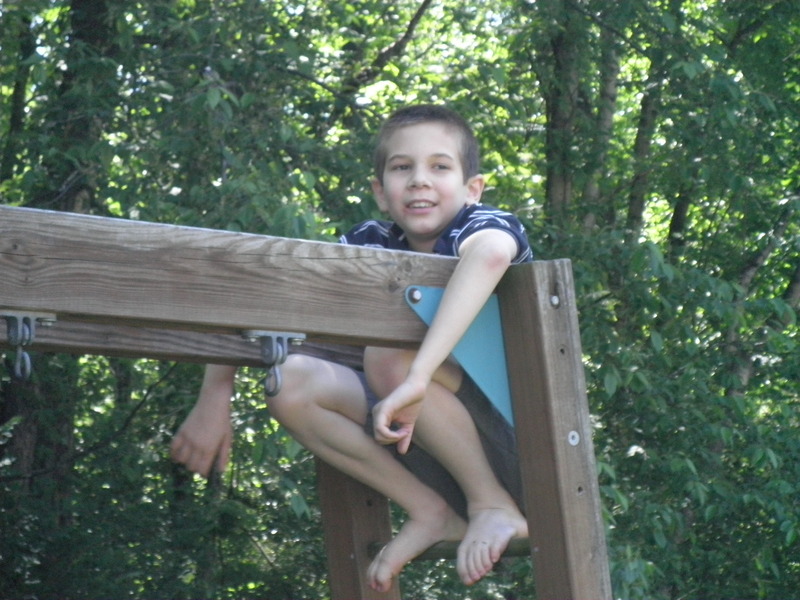 My son is not Autistic but we will find out more of “what” he is after June 11 Nuerophyschological Evaluation. My brain and hands are full with this child. I thank my body occasionally that my uterus collapsed and had to be removed because he is all I can handle. My late sister (whO passed when my son was 8 days old) worked for a company in NY called Grey Stone. I am sure you have heard of them. I read all of your blog updates and I am in awe of your strength and determination. Thank you for teaching me that we mothers can get through the worst days! Amy, I love your candor and honesty. I really do. It makes me feel more normal. 🙂 But I worry for such selfish reasons…I need you in my life. I love to read your blogs, I can’t wait to open one when I see it on my computer. I need to know your life is OK and you are doing OK. Maybe it means that then I can do OK too. God never gives u more than u can handle. You are truly an amazing woman. I work at group home for the last 11 years . We have 48 children between the ages of 7-21.All these children seem like mine too. So god knows even the greatest parents sometimes need help. A nd I truly believe the homes I work at is truly bettering these children. It is a great feeling to see the changes in these children. Never doubt your purpose in the world, because u are a choose angel for god gave u a ex large heart and lots of patience and an extra special son.Be proud for all u do.god will bless u.
Mommy-Amy! I have my own Rhinebeck bridge so I hear where you’re coming from. But you are so loved and needed in this world. You have no idea how much you impact this world, through your writing and the amount of love you generously spread to those in your life. I love you so much – please hang in there!